Have you ever wondered why a standard bottle of wine is 750 ml? Well, it actually remains unknown precisely why, but one thing is sure, it has become the worldwide standard. A brief history helps understand how we got to this state. Glass wine bottles didn’t become widely available before the 19th century. Before that, wine was mainly transported in bulk in amphorae or wooden containers such as barrels. When glass bottles become popular though, it is surprising to see that both continental Europe and Great Britain had glass containers of a similar size. The British had an official glass-container size of a fifth of their Imperial (UK) Gallon at around 900 ml, while other Europeans’ bottles gravitated around 700 ml to 800 ml. The US officially adopted the 750 ml bottle as a standard in 1979, as a metric equivalent to the fifth of a US Gallon (757 ml). It was the capacity that an average glass-blower was able to shape in one steady blow. It seemed to be a convenient ration of wine for a man during a meal. Today in Europe, only a handful of regions are allowed to use any other bottle size, as uncommon exceptions to the European law. The typically-shaped Clavelin bottle of the Jura wine region is one of them, containing 0.62 litre. There seems to be no limit to how big a wine bottle can be. 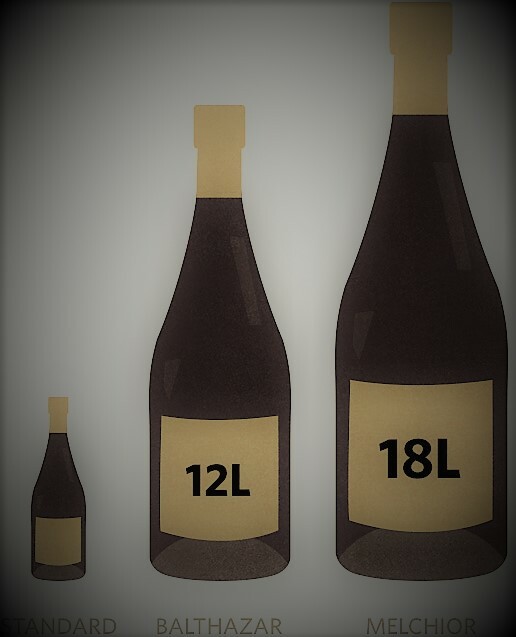 As huge as they may be, super-large wine bottle formats have generally been given a name, after a Biblical King or historical figure more often than not. Balthazar, which contains 12 liters of wine or the equivalent of 16 standard 750 ml bottles. It is named after one of the Three Wise Men who brought gifts at Jesus’ Nativity. Nebuchadnezzar, named after a famous King of Babylon, contains 15 litres of wine or the equivalent of 20 standard 750 ml bottles. Melchior was another of the Three Wise Men bringing presents to Jesus. The large format named after him holds 18 litres of wine or the equivalent of 24 standard 750 ml bottles. If you’re lucky enough to be hanging around elite circles of our wine world, you may come across even bigger wine bottles of extreme rarity, generally filled with Champagne sparkling wines. These could include a Primat (27 litres or 36 standard bottles) or a Melchizedek(30 litres or 40 standard bottles). The Maison Drappier of Champagne seems to be one of the most consistent in releasing such enormous formats. We certainly do wish you get an opportunity to share such rarities, with many wine-loving friends obviously. These super-large bottles are hand-filled in very extremely limited quantities only in world top estates and command very high prices.